The lovable Labrador Retriever may seem like an unlikely candidate for a dangerous dog; however, they are known at attack. Fiercely loyal, these dogs are very popular as family pets and are usually great around children. It is their love for their human families that can get them in trouble, doing whatever it takes to protect their humans and their territory, including biting other humans. The Labrador Retriever is one of the most popular dogs in the U.S., Canada, U.K. and Australia, with the highest registered ownership of any breed of dog. These dogs are popular for their outgoing nature and playfulness that makes them ideal for most families. Easy to train and willing to please, most of these dogs are safe around children and family members of all ages. In addition to being a family pet, Labrador Retrievers are also sporting dogs. Used in bird hunting and in sporting competitions, these dogs love to retrieve, as their name suggests. Whether it is a ball or a duck, labs are happiest when they are out retrieving items for their human companions. These dogs are extremely loyal, which is why any threat to their environment can change these amiable pets into fierce protectors in a moments notice. 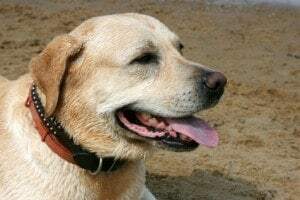 Although very few people have been fatally harmed by a Labrador Retriever, these dogs are known to bite and cause serious damage to their victims. It is the labs good nature that puts people, especially strangers, at risk; families who love these dogs cannot imagine them ever being hostile and may not properly restrain or confine them. However, while a lab may be kind and gentle with their human pack, they can be aggressive in protecting their pack and their territory. The owners of these dogs are usually the reason that unsuspecting people and children become bite victims of Labrador Retrievers. While other more notorious breeds are carefully confined and restrained, too many owners of labs believe their dogs are not dangerous. However, any dog can bite when they feel threatened, especially ones as loyal and protective as labs. Left off of a leash or out in a front yard without a fence, a lab can quickly go from a sweet, playful dog to a guardian of their home or family. Labrador Retrievers and lab mix breeds have maimed 59 people, caused bodily harm to 74 others and killed 4 people in the last 30 years. They have actually caused harm to more four times as many people as Doberman Pinschers, which are perceived as more dangerous and aggressive dogs. The injuries that can be inflicted can have just as much damage as any other large dog, causing financial and emotional trauma on the victims. Those who have been injured by these dogs due to the fault of the dog’s owner deserve to be compensated for their medical bills, lost wages and the many other expenses that can accompany this type of injury. The truth is that most people injured in dog bite attacks never receive any compensation for their injuries. Some people are hesitant to pursue a claim against a friend, neighbor or relative. Others are simply unaware that the law allows a person bitten by a dog, like a Labrador Retriever, to be compensated. Rosenfeld Injury Lawyers LLC has represented people bitten by labs in Chicago and across Illinois. We invite you to discuss your dog attack case without cost or obligation on your end. Call us at 888-424-5757 or fill out our online contact form for a free consultation today.